You are currently browsing the Suburban Homesteading – Frugal Living blog archives for March, 2013. March is the month that begins the transition between a cold blustery winter and the warm sparkle of spring. It’s a time when I clean the fridge and freezers, taking stock of the kitchen pantry and preparing for an end of winter stocking up trip. Bins full of chicken and duck and lamb are removed and counted, assessing our livestock needs for the coming spring and summer. Beef and pork are traded for or purchased from local growers when needed. It’s a time when the wood pile dwindles, frost protection comes off delicate plants, down blankets are removed from the beds and replaced with lighter weight cotton covers. It’s a time for moving patio furniture out into the garden, adorning it with plush cushions, waiting for an afternoon of lingering and laziness. And, it was during this clean out and changing of seasons that I discovered a lone brown bag tucked way in the back of the fridge. With my new job and hours spent on work and farm projects sometimes things go astray and are forgotten about in the rush of the schedule. But, never fear, not much goes to waste on our homestead. That’s just the way we are…frugal to a fault—sometimes. In this case I wasn’t resurrecting some decimated old piece of produce. Rather, slightly aged heirloom apples too ripe for fresh eating, but nonetheless good enough for cooking. There weren’t many, maybe half a dozen or so left over from an apple farm tour and tasting back when the warmth of summer was fading into the shadows and color of fall. There were Heaven Scent, a small, dense, eating apple and a few Splendors, another larger, crisp eating apple, and a mystery apple, with dark skin and a slightly pinkish flesh. None were the best for pies or cobbler, but they were flavorful enough to make apple butter. Fruit butters are kind of a misnomer because there isn’t any butter in them at all. They are highly cooked down spiced fruit that thickens as the moisture is evaporated away. The end result is smooth, spreadable, like room-temperature butter. Almost any fruit can be made into a butter, but apple is the most common and popular followed by plum, pear and peach. A fall favorite is pumpkin butter that can be spread on bread or used in a variety of baked goods. The advantage of fruit butters, especially for a small farm like mine, is that they can be made in small batches, using a small amount of fruit. They are also easy to make, use no pectin and use just half the sugar of regular jams or fruit preserves. Conventional fruit butters tie you to a stove, stirring a bubbling pot for hours. Who has time for that! 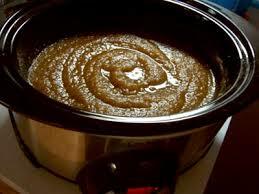 But, other methods, like the slow cooker, is more “fire and forget”, at least for most of the cooking process. This is the method I used. I placed all ingredients in the slow cooker, turned it on low and went about my farm work. By nightfall, I stirred everything well, hit it with my emersion blender, cracked the lid a bit and let it cook down more of the juices. The color was deep mahogany and the smell was nothing short of amazing. After a few more hours of cooking, my butter was ready to can. Fruit butters are canned the same way you can jam, with a 10-minute water bath to seal the deal. Any butter that won’t fit in the jars can be stored in the fridge and used in the coming week. When all was finished we ended up with 3 full jars of canned butter and small container for immediate eating. Now we can enjoy the flavors of fall on toast, English muffins, pancakes, waffles and even in quick breads and cakes. It’s the perfect reminder of a season gone by. But, it’s also a reminder that that season will come again. All you have to do is wait for it.